Will you drive your Porsche this winter or put it in Storage? The answer to this question most likely depends on both where you live and what you drive. You might be the type that no matter what, you're driving your Porsche year round. Or, maybe you live in a colder climate with lots of snow and salt and need to prepare your Porsche for winter storage. Maybe you're lucky and do both, we do (we store our 911 and 993 and drive our Cayenne). What ever you do there are choices you need to make and things to consider. Saying goodbye to your baby while it sits quietly in winter hibernation is hard enough. Don't make it any harder on yourself by making some of these common mistakes that will haunt you come spring time. Common Mistake #1: Forgetting to over-inflate your tires. At best, this will leave you with flat spots. At worst, you might need a whole new set of tires. What ever you do, don't go over the maximum pressure recommended for your tire. A good Porsche tire gauge can help. Common Mistake #2: Forgetting to disconnect the battery or connect a trickle charger . There's nothing worse than going to start your Porsche for a nice spring drive and find the battery dead and you're not going anywhere. Common Mistake #3: Not using a fuel additive (like this fuel preservative from Griot's Garage) in your winter storage routine. Condensation in the fuel system is good for nothing but trouble. Common Mistake #4: Forgetting about your coolant lines. If you're air-cooled you don't need to worry about this, but for those of you with water in the veins, a Corrosion Inhibitor is essentially like a fuel additive for your coolant. It works to prevent corrosion from developing in your radiator and coolant lines. Common Mistake #5: Forgetting to reduce your insurance coverage. We're not agents, so be sure to talk with yours first, but if you're not going to be driving your Porsche you can remove or reduce a significant amount of your coverage. All you really need while it's being stored is "comprehensive". We save $100s every year with this little trick. These are but a few of the costly mistakes you could make if you don't store your Porsche properly. Check out our 10 Easy Steps to Winterize Your Porsche for a complete list, and links to products that will ensure your Porsche stays in tip-top shape while it's tucked away. Believe it or not, most 911s (excepting some older turbos) make for great winter drivers. The rear-engine configuration puts so much weight over the drive tires, as long as you have good winter tires, you're biggest concern (besides other drivers) will probably be ground clearance and getting over larger snow drifts. Look for fresh snow – it provides more grip. For even more detailed information and tips see our post on preparing your Porsche for winter driving. 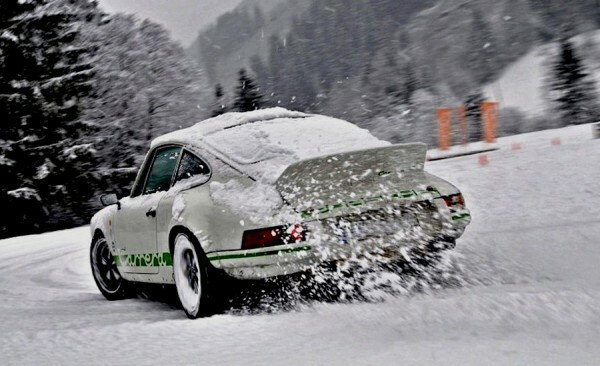 Be sure to read to the end as lots of users posted their own great Porsche winter driving tips. Great article, but my GT3 has a 3M protection over most of the car. Do I follow the same detailing instructions, even the clay, etc. What soap, polish, clay, waw, do you recommend? Will any of this yellow or discolor or stain the 3M plastic? This is my first time Winter driving a 996. I changed to winter tires with the recommendation of the Porsche Zentrum at Nurnberg. The dealership did a winter check up and found no issues. I had the coolant, brake fluid, brake rotor and pads flushed/replaced before coming to Germany . I will drive the car as much as possible and will be kept in the garage at nights. I can’t wash the car at the house so I have to use the commercial machines at ESSO Gas Stations, which BTW don’t look as rough on the paint as the one in the states. I keep a trickle charger on my Boxster and do drive it on the occasional nice day. Otherwise the garage keeps it out of the weather most of the time. Does Porsche recommend any specific winter tires for each model? Love the picture of the Porsche on ice! We recommend plugging the tips too in our article on winterizing (we use keg cups) but tennis balls will work great too. Closing the heater ducts is a great idea and we’ll add it to the list for next year! Very good suggestions – I have found mice living in my 944 after storage!